Authentic, homestyle cooking that won over our bellies, making us realise how much exciting food there is to explore from Bihar. 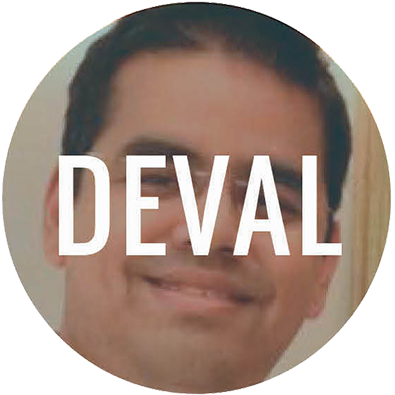 Bored with regular North Indian fare, we decided to give another piece of India a try. 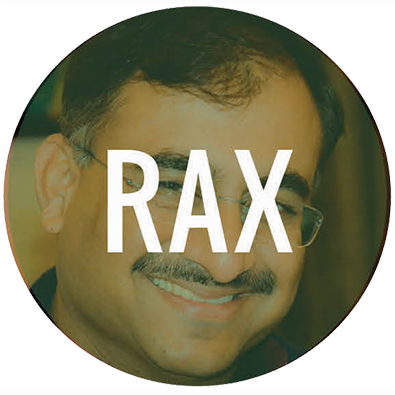 The menu was a pleasant suprise, because I had not expected so much variety in Bihari cuisine. 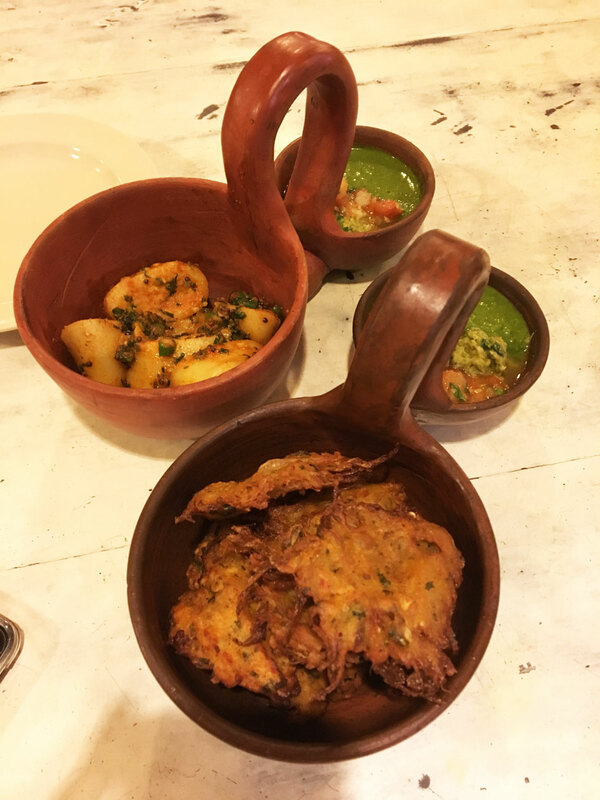 The Pakora basket was a mix of Aloo, Sabudana and Baingan pakoras, all crisp and hot, a welcome start to the cold winter night. Baggia Basket were sort of rice dumplings in a spicy paste, the bland and spicy balanced each other. The Dal and Pyaaz Kachri were more regular but well made. The main course started with Makhana Thali which had these delighful pooris made of palak. The Litti Choka was not quite up to my expectations. 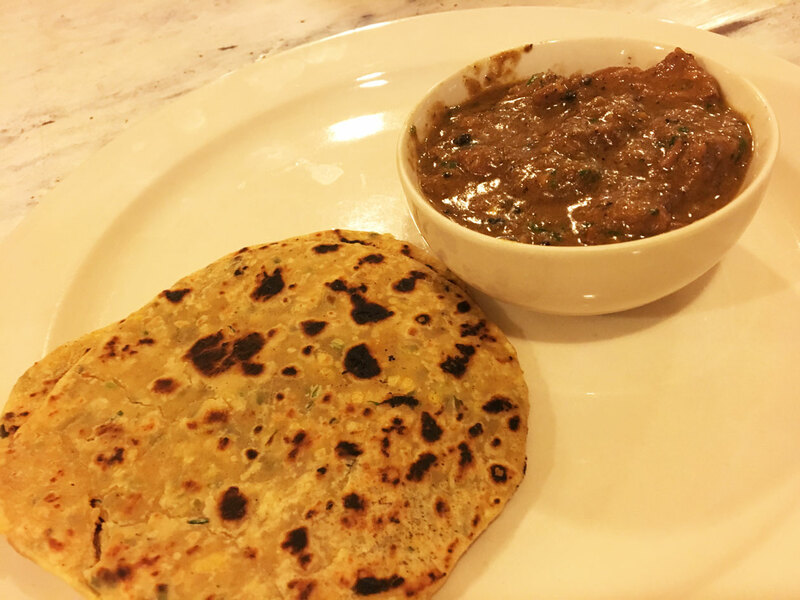 The Dana Jhamarua had a mustard based baingan and aloo sabzi with sattu parantha, which could be passed. 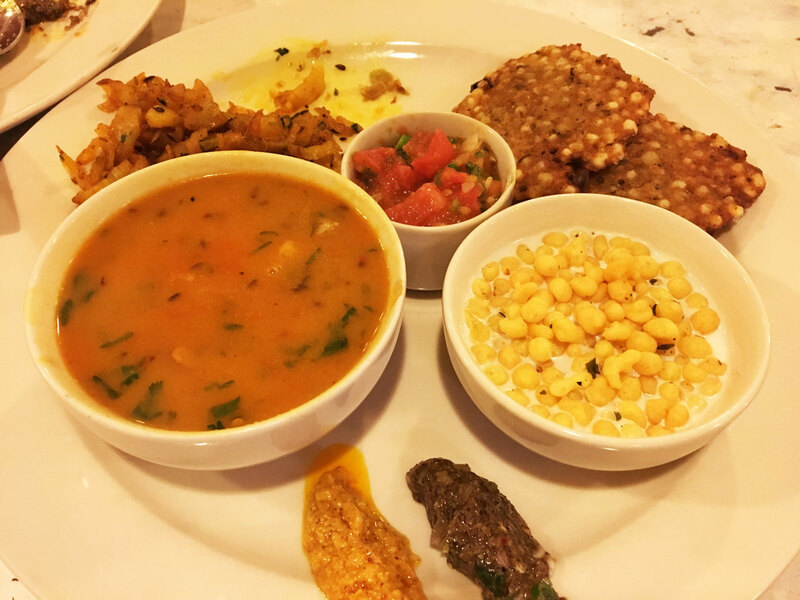 But the best was the Dalpitti – a spicy light lentil soup with sabudana poori and a simple shredded aloo side dish. 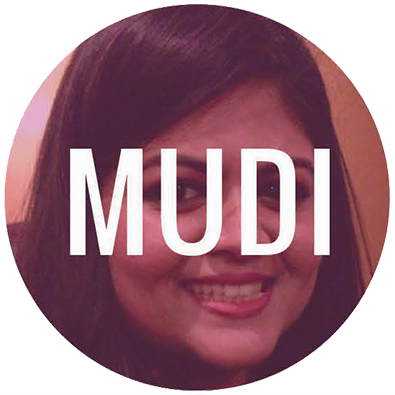 The owner, Puja Sahu was there to guide us through the menu which was of immense help. 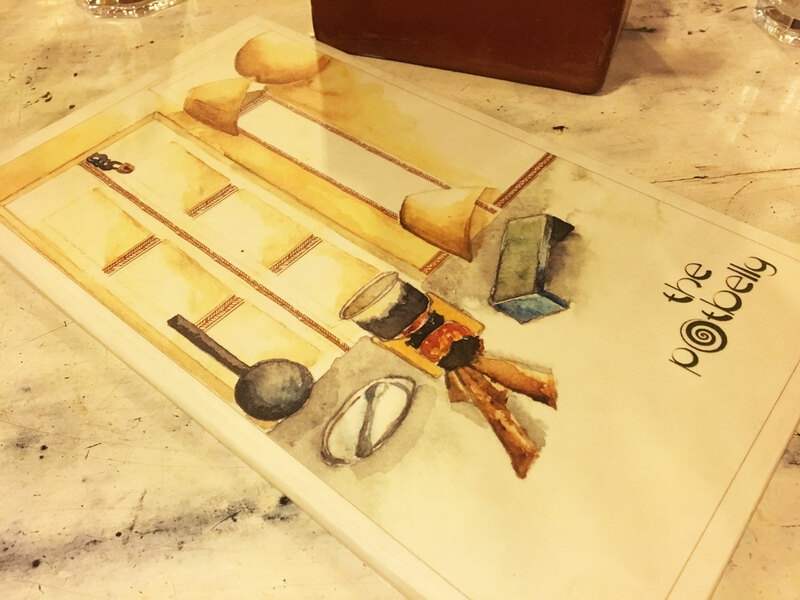 The Potbelly Cafe gives us a taste of regional Indian, for which I am thankful because while we explore all the international cuisines extensively, we sadly give the richness of our own a miss. But maybe I am wrong, because the place was packed and seemingly popular. 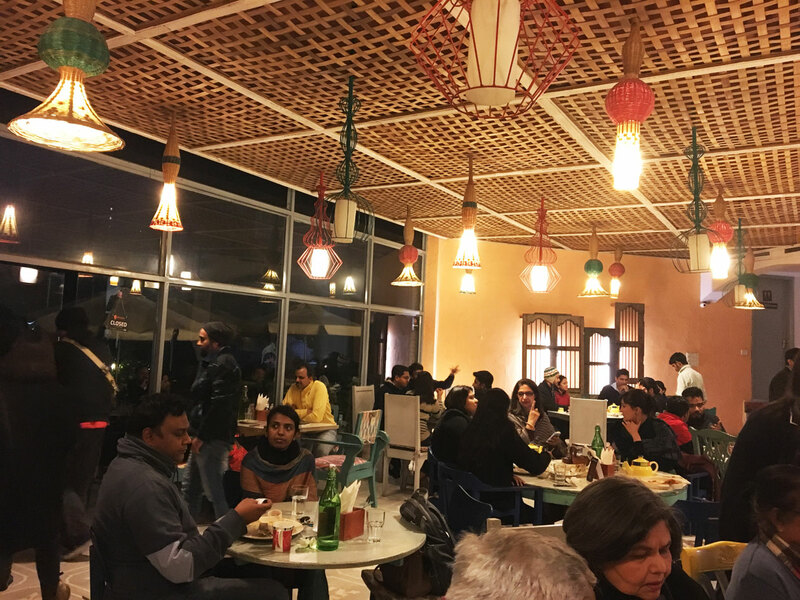 We had a lovely evening at the quaint pot belly cafe in Chanakyapuri. A little pathway lead us to the warmly lit place. 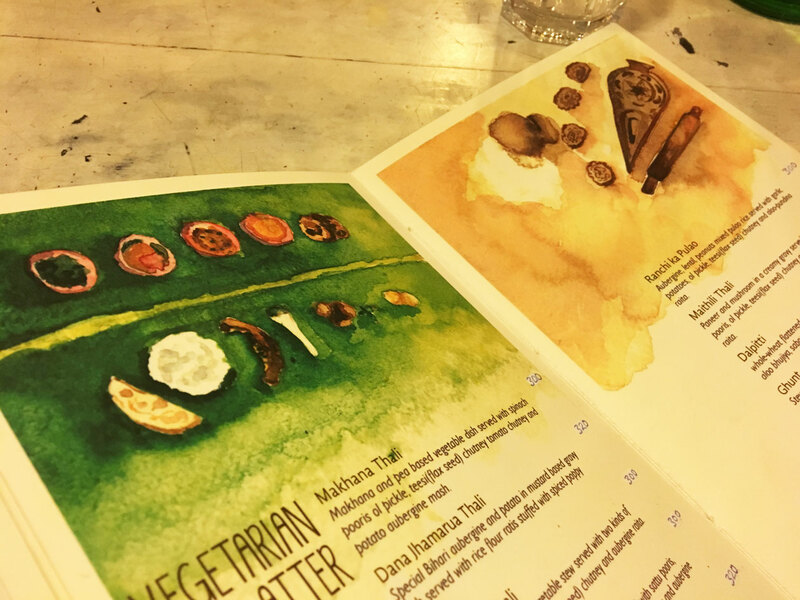 With a beautiful illustrated menu – we proceeded to order a fair amount of appetisers and mains. I had looked at the pictures on zomato ahead of arriving and was looking forward to a special kebab that wasn’t available on the day. We had meat pakoras that were spicy and delightful, assorted veggie pakoras and the green chutney was by far the best I’ve eaten. It was definitely hand pounded and tasted of a mix of pudina and dhaniya. The pepper chicken wasn’t well cooked or flavoured so I swapped it for a masala chicken curry. The flavoured parathas that accompanied the meats were delicious. The chicken curry was also good but I probably wouldn’t return just for that. We also tried their Makhana curry, aloo, puris, which were all delicious. 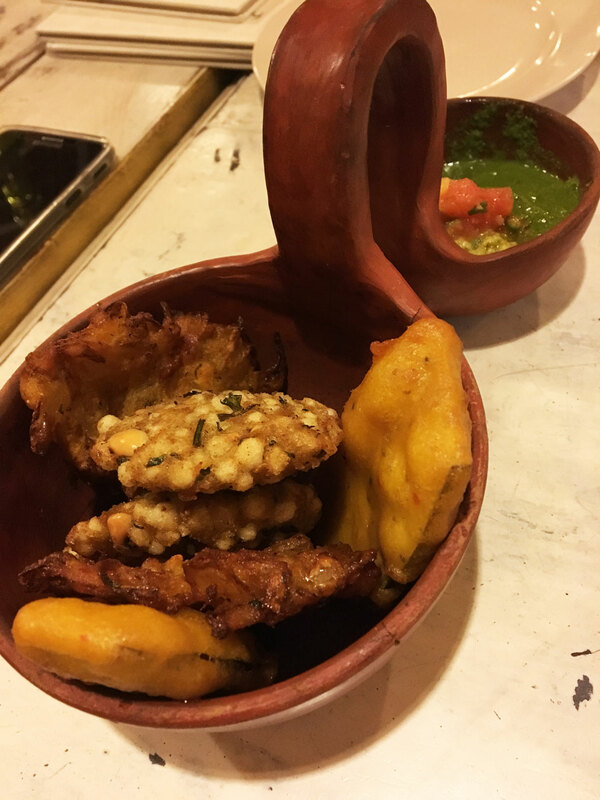 The Sabudana puris were specially flavourful and crispy and soft inside. 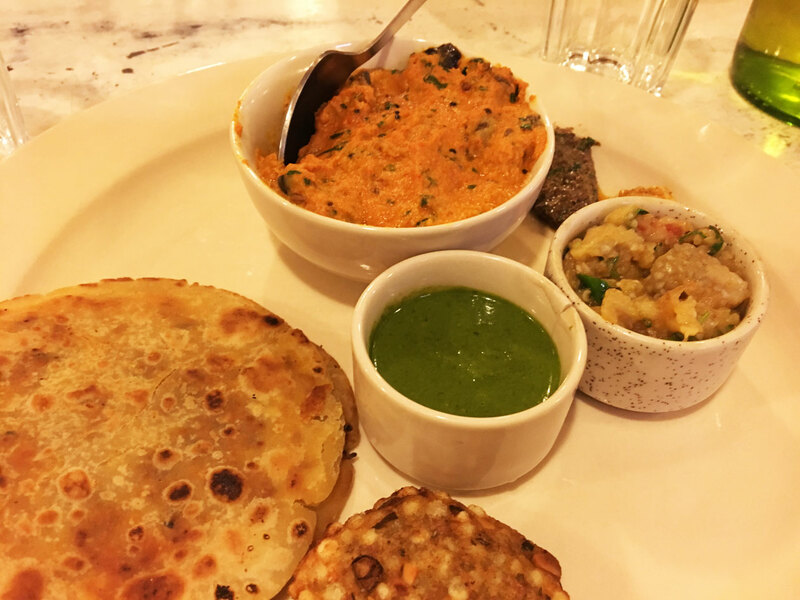 I think the vegetarian was actually much better than the meat and chicken, given that Bihari cuisine includes a fair amount of non-vegetarian food. I would recommend you visit The Potbelly to try it out for yourself! 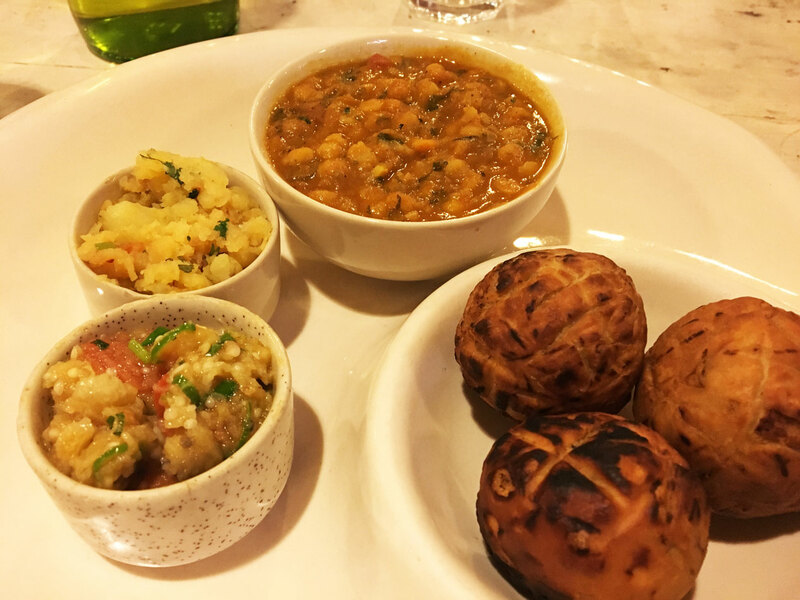 Bihari is not the first cuisine that comes to mind when you think about Indian fare, but one look at the menu and you’ll realize that there is so much more to it than lithi chokha! Phish Phingers and Pothia Machhli Fry were both great appetizers with the accompaniments making the dish. For the main course, I ordered Mutton Chaamp. The mutton was tender, perfectly cooked and came in a thick gravy. 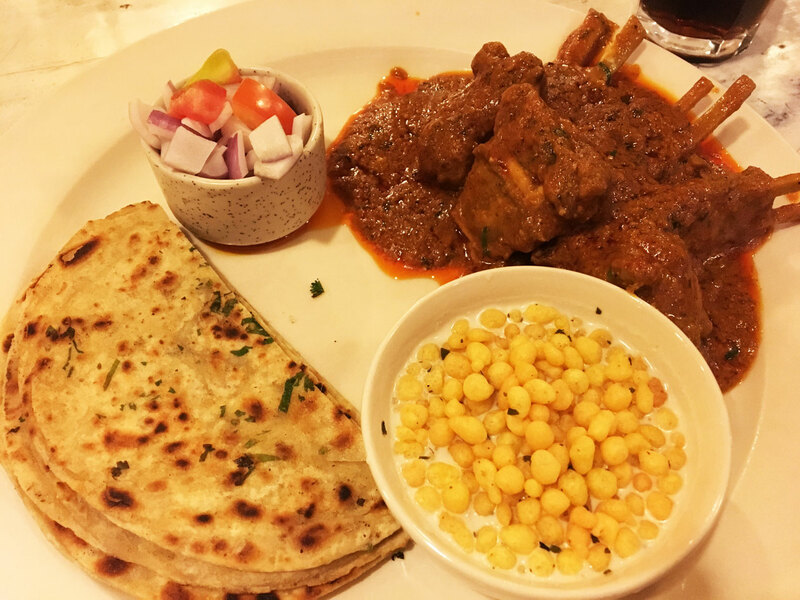 I was happy to partake some of the Champaran Style Mutton also ordered at the table. This had a very distinctive taste, that I enjoyed. I’ve been wanting to come to The Potbelly for a long time, and am I glad we made it happen. It is so refreshing to eat regional Indian food. I crave flavours that are not North Indian or Mughlai so it’s very exciting when one discovers a place like The Potbelly. 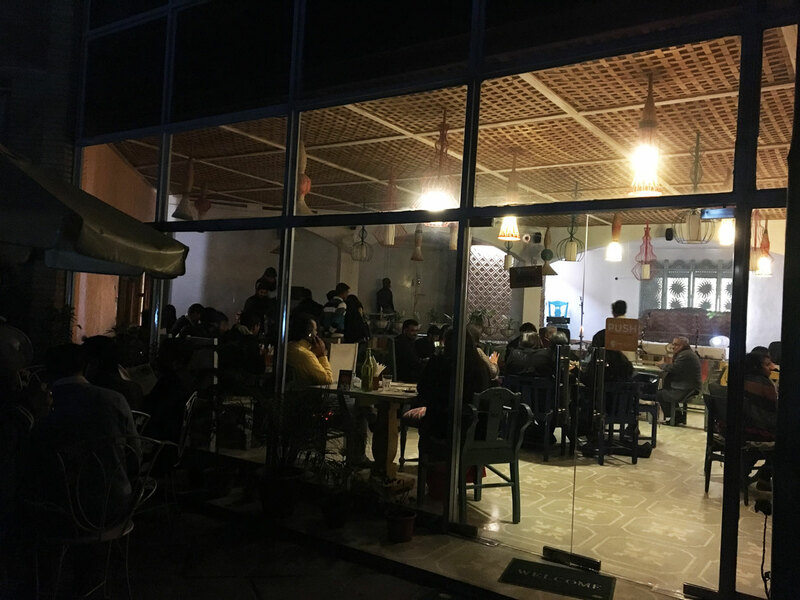 The atmosphere was casual and inviting, with all tables occupied the evening we visited. The starters were all delicious and more-ish, disappearing rather fast from the table into our own potbellies. Being a Lithi Chokha fan, I was quite disappointed when I ate it here, neither the lithi nor the chokha packed a punch. Everything else, however, was exceptional. My favourite was the paneer and mushroom, as well as the mashed baingan that accompanied everything, called Dana Jhamarua. The menu at The Potbelly is extensive and interesting, and makes you want to come back and try whatever you didn’t. The service and staff were pleasant while the owner herself was attending to customers and advising diners on what to order. It’s this personal attention that I think has helped make Potbelly the quiet hero of Bihar in the chicken tikka town that is NCR. 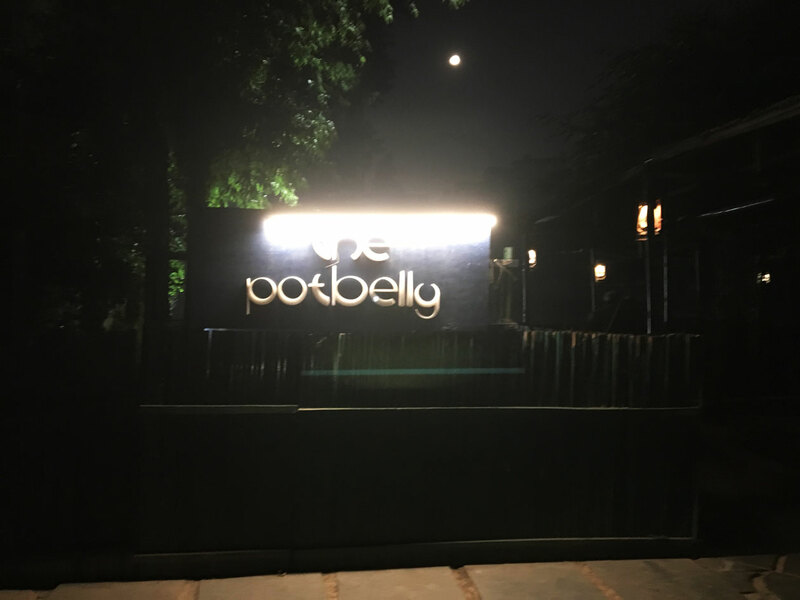 The Potbelly, Plot 15, Bihar Niwas, Behind Yashwant Place, Chanakyapuri, New Delhi. Call them at 011 26112764.